The pendulum to the left is called "Nightmare." It was custom-designed for Gary Thompson who has given us permission to show it to you. If you'd like to know what the process is for this custom-design, go here because the process is going to be the same for any private commission. What kind of pendulum would you have if you could have anything incorporated into your design? Our designer, Sheree Zielke, lives for challenges like that. Seriously. There are many ways to customize your pendulum so it evolves into exactly what you envision. Do you have a special request...or routine components you want included? Please tell us. What metal attracts you? Pure copper? Sterling silver? Gold? We work in all metals, but when the metals get really precious the base fee will go up. What about the gemstones? We have access to dozens of different semi-precious gemstones. Some of the most popular: black obsidian, lapis lazuli, amethyst, malachite, bloodstone, African jasper, carnelian, garnet, and opaline. Tell us your preferences. What color sets your soul on fire? What color sets your creative juices flowing? Color is very important. Sheree works diligently to accommodate all client's specific color requests. What about sparkle? Do you want Swarovski crystals incorporated to give your piece stage zing? Are you into antiquities? Sheree has incorporated fossils, petrified wood, Red Sea hagstones, and vintage crystal drawer pulls into her custom designs. Sing out! What do you want? Sheree is a wizard at interpreting our clients' desires. She is now the creator of nearly 1000 custom designs, designs that have been shipped worldwide. Yes, she will design for you no matter where you live. It might take a little time because she needs to set her own creative juices flowing, but once the process begins, it is usually fairly quick. Your piece will be shown to you element by element and then finally in its entirety. Once you approve, the piece will be officially named, a Certificate of Authenticity will be drawn up, and your new pendulum with be shipped in the safest and most expedient way possible. Don't wait another moment. 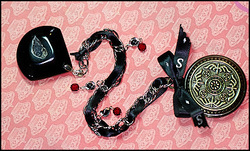 A custom-designed pendulum made in accordance with your specific wishes feels good to use, to hold in a performance. It really does. Because it is YOURS! No other performer will ever have another like it.